Trolley for cold cuts storage and maturing. Available also with aluminium or wooden bars. It includes a functional compartment conceived for the storage of temporarily unused bars. It is light and hardy at the same time, with or without the drop-in basin. 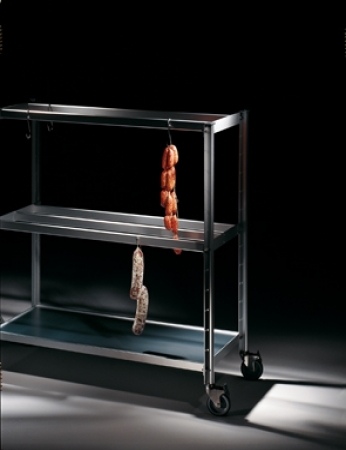 Trolley with removable hanging bars for salami. The model shown in the picture is 75x80h185 cm. Guides can be adjusted in height every 10 cm and you can choose the number of guides and bars according to your needs. Wheels are made from stainless steel and plastic, 125 mm in diameter (2 with brake).